Hello guys, hope you're doing good today? If yes. I have a good news for all 9mobile subscribers, the good news is that they can Now chat on whatsapp for free without having airtime or active Data subscription on thier line. I know you might be surprised can this be possible! Yes it can, because I also confirm this before posting as well. 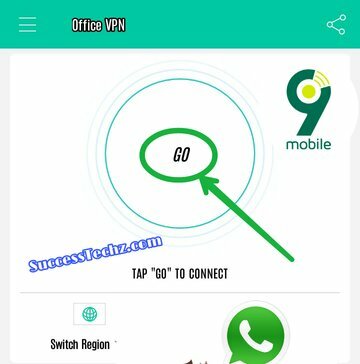 There's a new VPN Now on Playstore called Office VPN. This VPN connected on 9mobile Network and it works free on Whatsapp only without Airtime or Active Data. So without too much time my lovers, let me quickly explain and Show you how you can make use of this VPN To chat free on whatsapp However we are still looking forward for everyone to enjoy unlimited free browsing. But before then let me show you how to enjoy this first. So let get started. 2. Once Download Completed👍. Now Open The VPN you just Download Then Tap on Go icon and wait ✋ for few minutes for the VPN to Get connected. Once it get connected just open whatsapp app from your phone and keep chatting for free. No. As for now it works only with whatsapp. But we will keep you updated when will found more trick.